The air gap 10 cm thick between the walls helps to insulate the cooking zone. From above walls become covered by rather thin tiles from the processed stone. In places of direct contact with fire, it is recommended to use refractory clay: it is heat resistant and does not crack for a long time. 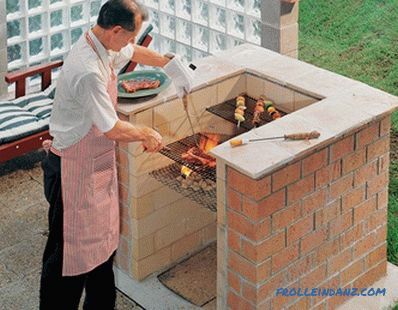 The foundation of the barbecue is a 30 cm in-depth support supporting the reinforced plate. A similar foundation, called "floating", is designed with a view to a possible shift with temperature. For local specifications of building codes, you can check with the building supervisor. 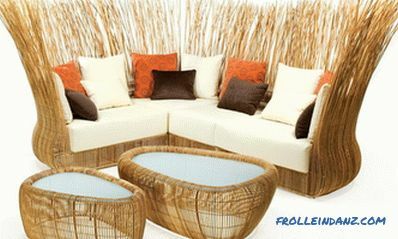 Prepare a platform 120 * 150 cm. Around the perimeter of the site, dig a trench 30 cm wide and 25 cm deep. Remove 10 cm of soil from the remaining middle of the trench is a rectangle and round off its edges. Install the formwork around the site so that it protrudes 5 cm above the ground in the rear part and 3. 5-4 cm in the front part (a small slope is necessary for effective rainwater discharge). 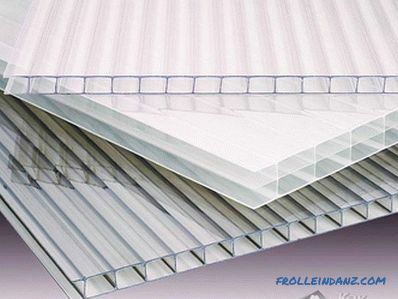 Strengthen the support with five 130 cm pieces of reinforcement. Lay two pieces of reinforcement 10 cm from the front and back sides of the trench; Place the remaining three evenly between them. 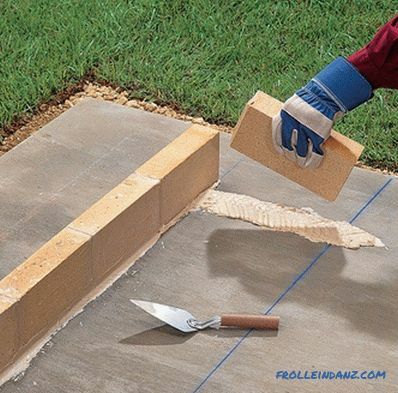 Lubricate the formwork with linseed oil or a special anti-adhesive agent and fill with concrete. 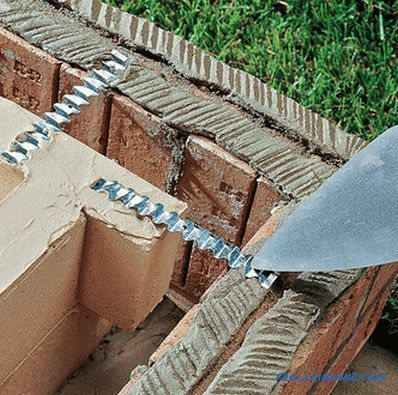 After the foundation hardens, which takes about a week, apply the chalk on it, indicating the location of the inner edge of the brick wall. 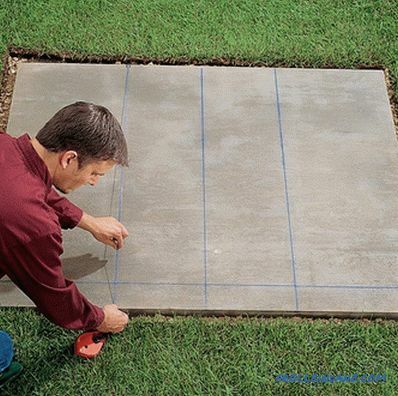 Draw a line 10 cm from the front edge of the foundation and perpendicular to it, in the center of the site, another one. Symmetrically about the centerline, draw a rectangle of 60 * 80 cm, one side of which is the first line. Place around the outside of the rectangle (without using a mortar) the first layer of refractory brick, leaving gaps of 0. 3 cm. 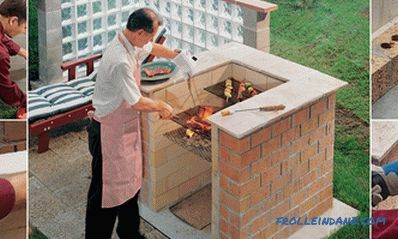 Note: the correct position of the internal walls is necessary so that they can support the grill grates. 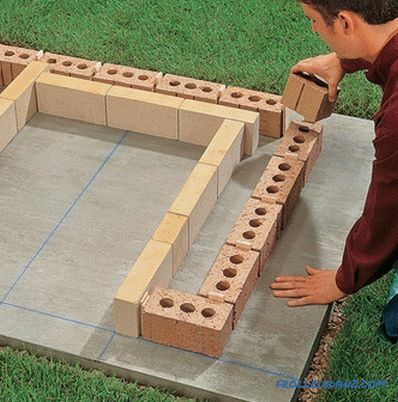 Start by placing whole bricks at the front line, in the middle of the short wall lay the cut brick. 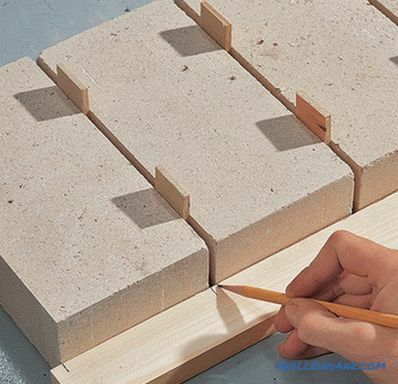 Lay out the outer wall of a modular brick measuring 10 * 8 * 20 cm. Leave a gap between the bricks at ~ 1 cm. The back wall should pass ~ 1 cm from the last refractory brick of the left wall. The cut brick should be in the middle of the left wall. Chalk the perimeter of the outer wall. 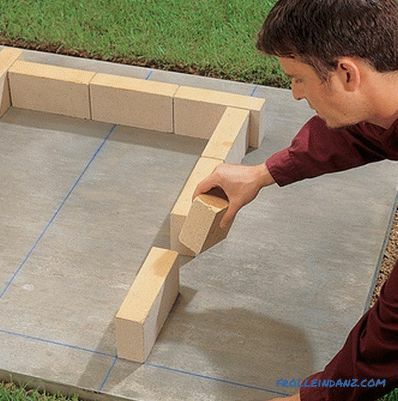 Make a template for masonry. On a wooden bar, apply 8 marks corresponding to the size of the refractory brick, with a gap of 1 cm for the bottom seam and 0. 3 cm for the remaining seams. The upper part of the final row should be at a distance of 90 cm from the bottom edge. Transfer the top line to the other side of the template ruler. Lay out 11 rows of modular bricks so that the last row coincides with the mark of 90 cm (the thickness of each seam should be about 1 cm). Put the layer of mortar needed for 1 cm of the seam along chalked lines for the inner wall. 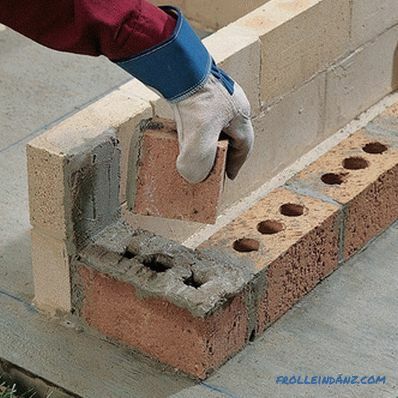 Lay the first row of refractory bricks with a gap of 0. 3 cm. Lay the first row of bricks of the outer wall. 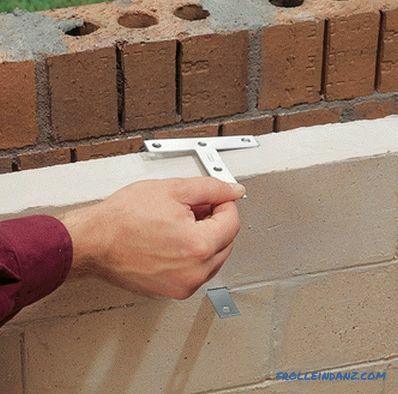 Use oiled 1 cm inserts to create air vents after the front bricks of the left and right walls. Start the second row of masonry of the outer wall with a half-brick adjacent to the inner wall. The bricks in the second row must be staggered relative to the first row. Alternately stack the rows of the inner and outer walls, after each row, checking the quality of the masonry using the pattern and level made. The layout of the brick barbecue from the brick with your own hands, you can follow the photos accompanying our instructions. 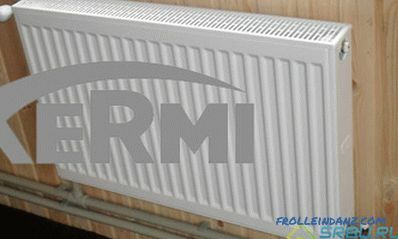 Place the metal bundles between the corners of the inner and outer walls on the second, third, fifth, and seventh rows. When the solution hardens enough to withstand the minimum finger pressure (check the seams on both walls every few rows), smooth it out.To do this, you need a special tool for jointing. 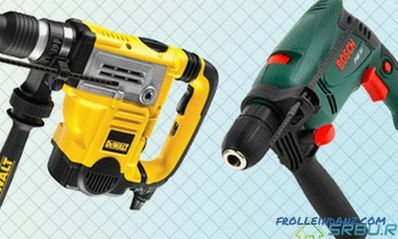 The time when it is time to start jointing depends on the type of mortar used. Above the fifth, sixth and seventh rows of masonry, attach T-shaped plates that will serve to support the grill grates. Use a 10 cm plate with side projections no thicker than 2. 5 mm. 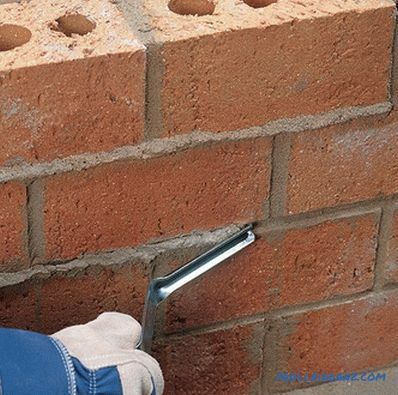 Arrange the plates along the side walls of refractory bricks at a distance of 8, 30, 45 and 67 cm from the back wall. 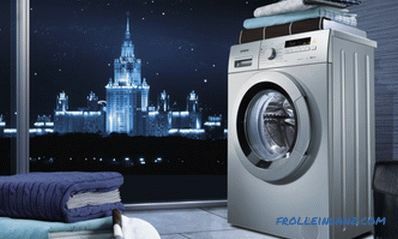 When you have finished laying the walls, install a top floor of treated natural stone. On the upper surface of the inner and outer walls, lay a layer of mortar designed for a seam thickness of 1 cm. 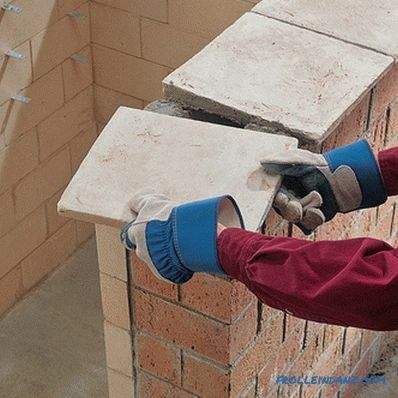 Lay the tile overlap, one edge of which should be flush with the inner surface of the refractory brick. Make sure the tiles are level. Treat the seams when the mortar begins to set. After a week, seal the joints between the plates with a special compound and install the grill.